Banjo, Fiddle, And Viola Are Easy To Learn! Contact me for Lessons on Skype! One of the biggest myths about learning fiddle or viola is that it's hard to learn. The next biggest myth is that you have to practice "really really hard to be any good"
These two rumors are usually spread by non musician parents wanting to discourage their kids from playing. I'm entirely self taught,and I consider my teacher to be Wayne Erbsen. I took up fiddle at 47,(proving it's never too late to learn) on a inexpensive fiddle I won off Goodwill Auctions. Since then I finally found the two fiddles and violas I was looking for. I'm a 3rd generation fiddler and a 1st generation violist who also plays and teaches banjo and mandolin. See comments from happy students below! 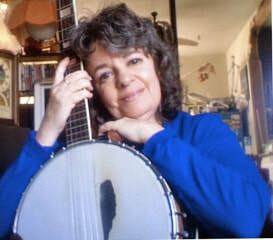 Banjo wise,I teach two basic styles: two finger style (pre-bluegrass) and clawhammer. I decided to focus on these two styles as they're easy to get a grasp of and most beginners find these styles delightful and fun to play. The average length of each class is app. 30 min. I ask students to have their fiddle/viola tuned up and that they be warmed up in time for their lesson. I teach students weekly as in my experience,students who have lessons twice a month don't practice till a day before their lesson. So I require that students have a lesson a week with me,and that they practice 30 min a day. Fiddlers: A copy of Wayne Erbsen's book "Fiddling For The Complete Ignoramous"
Violists: I will be sending you PDFs of tunes ,etc for you to work with. I charge $39 per lesson,payable via Paypal. Payment must be made before your lesson. "I am a beginner instrument player learning the Mandolin. Sherrie is an awesome teacher. I was very nervous at first but Sherrie is very patient and easy to talk with, so you forget you are nervous right away. She goes at your pace and explains things in easy to understand terms. I really enjoy taking lessons and learning with Sherrie! I would recommend her highly!"